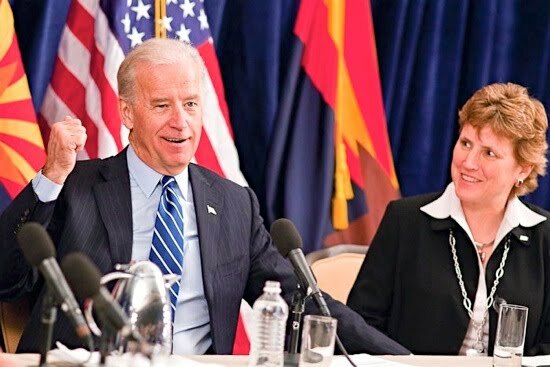 Joe Biden, VPOTUS (Vice President of the US) was in Phoenix this morning. He spoke at a fund raiser for Gabby Giffords and Ann Kirkpatrick, a couple of Arizona’s Democratic congress women, and then hit the airport to talk about the economic stimulus package. But Biden’s event was remarkably relaxed. It’s the difference between being VPOTUS and POTUS. We walked into the room about 30 minutes before Biden and were able to use pretty short lenses. It was a lot more relaxed than any of the POTUS events I’ve covered. For his part, Biden didn’t disappoint. He was expressive and used his hands to punctuate his points. All in all, for what it was, a good morning.